atelierniSHASHA: atelierniSHASHA on this year's FDQ Spring Issue - again !!! atelierniSHASHA on this year's FDQ Spring Issue - again !!! I'm so ecstatic to just share a really exciting news with you guys today. Our dear doll friend Michaela Unbehau, Germany-based doll photographer with works you can find in her Flickr, Facebook, and Instagram accounts as well as doll magazines like Fashion Doll Quarterly and Haute Doll, recently contributed an article which also features my little creations! This is just a peek from the pages of the newest Fashion Doll Quarterly issue - Spring 2016. 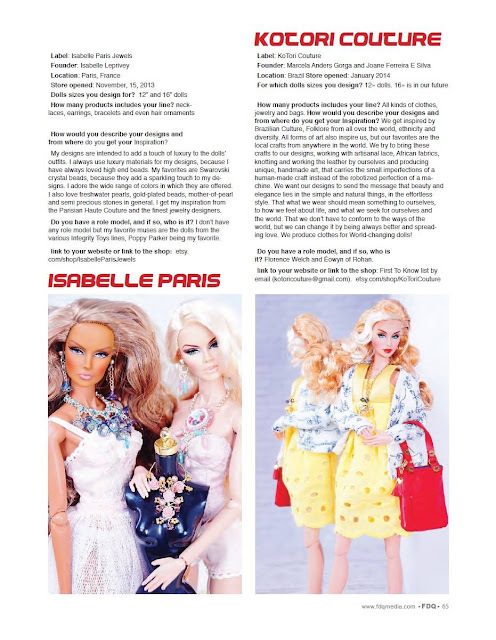 Seeing Michaela's dolls in this whole page, all glam-ed up in my creations is just pure joy. Although I have enjoyed and collected fashion magazines since I was a teenager, I never really dreamed of seeing my creations on one. But here they are - and even for the second time! Yup, the second time around as last year, Michaela also contributed to FDQ, and shared one of her photos - a gorgeous doll wearing yet another atelierniSHASHA ensemble. 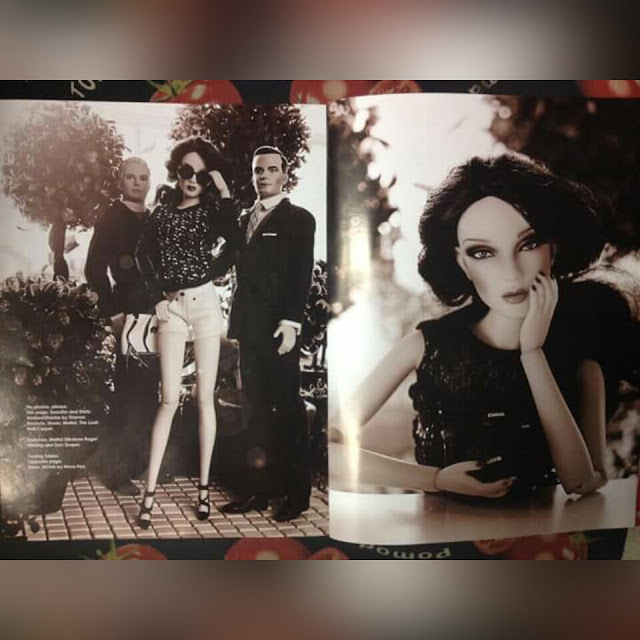 Last year's FRD Spring Issue - the doll to the left in sweater and shorts - uber cool! I am also super happy to see my doll soulmates from KoTori Couture - Marcela and Jojo, featured in the same latest Spring issue of FDQ. I love these girls eclectic aesthetic, very natural, very raw, so rich in culture yet so global in its vibe - something I would love for my dolls and myself. KoTori on the right side of the page - super gorgeous, eh? We are actually having a virtual party right now over at Facebook, where the KoTori girls and I mainly hang out. LOL! And my girls - if only I had a bar full of fabulous drinks - for sure would be partying to celebrate such wonderful achievement for the atelier. Thank you so much for sharing this momentous event with us, and more importantly, thank you for supporting us with our craft and passion - we are so blessed to make a living out of the things we love to do. You inspire us always! Thanks so much and see you again next time, guys! Thanks so much, j! This is a really great thing for me as I never even thought of seeing my creations on a print magazine... I thought it was just impossible. My greatest thanks to Michaela and to you guys who continue to inspire me! Love lots! Congratulations! Your clothes are awesome so I am very happy to see that they will be featured in FDQ for the spring issue. Congratulations and it's well deserved! Congratulations Shasha!! This is totally awesome! Your work is well deserving of this recognition!!! Way to go! Thanks so much, Georgia Girl!!! I know, I should throw a party or something, right? Congratulations on the exposure! I enjoyed seeing your fashions in virtual print. Awwww, glad you liked them, Debbie! Michaela is such a master of showing the best in my creations! What's up at the atelier?